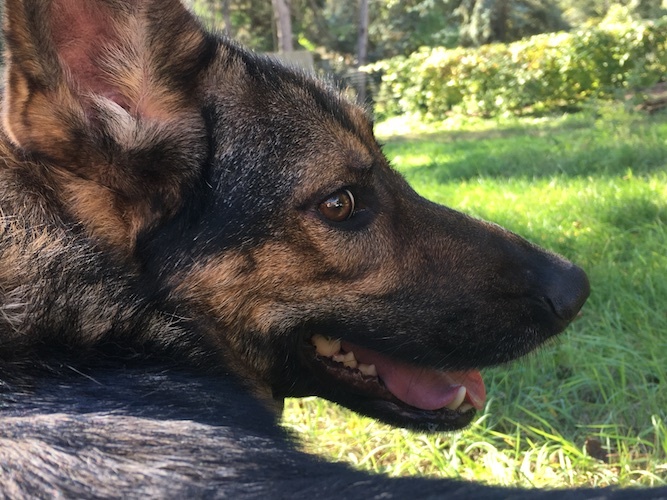 German Shepherd Dog Forums > Members Corner > Pictures! Pictures! Pictures! > Zage's "Everyday Adventures"
Happy thread! Inspires me to try to take more photos of my dog. Such fun at the beach. When you cut to your Keeshond briefly, I was reminded of my mom at the beach...she and my aunt would sit away from the water, watching the “crazy young folks”! Great pics and video!! Love the paw prints in the sand!!!! wonderful times to share!!! Thanks! I love seeing their prints in the sand - always a favorite picture to have. Lena still loooves to be included in our adventures, but definitely takes a more relaxed approach to it all. Not nearly so much frolicking in the water as when she was younger. 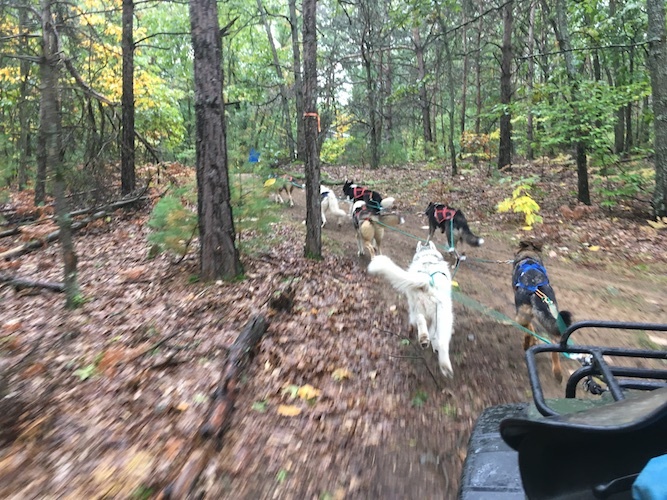 One weekend in September, Zage and I took a trip a little ways north to attend a leader training (for mushing). With our biggest goal just being exposure to the mushing environment, and to let her experience any new things we could find! The whole day really went well. 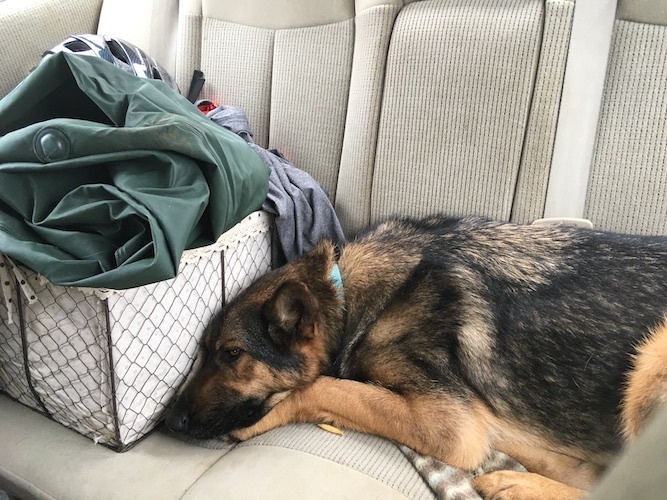 Zage was acting comfortable enough (with all the noise and controlled chaos), that when offered, we took the chance to hook her up with an experienced team on a quad to run some trails. She ran quite nicely, for her first time on a team. After a little while figuring it out, she dropped her head and tail (signs of "clocking in"). And of course, we had a quiet ride home as we were both quite tired! 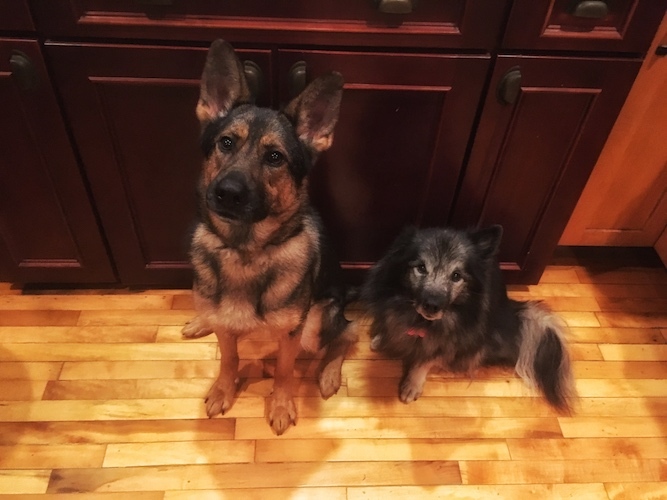 did you see any difference in outlook/pulling drive/enjoyment between your GSD and those huskies (who are born & bred to it)? There is definitely a difference! The huskies I know personally (and others that I've met at events and trainings), both Siberian and Alaskan, do have a genetic drive for the pulling. That is their purpose, and they live for it! If you ever have a chance to attend a race, it's so cool to see those dogs light up when they see the chance that they may get to go run with their musher. 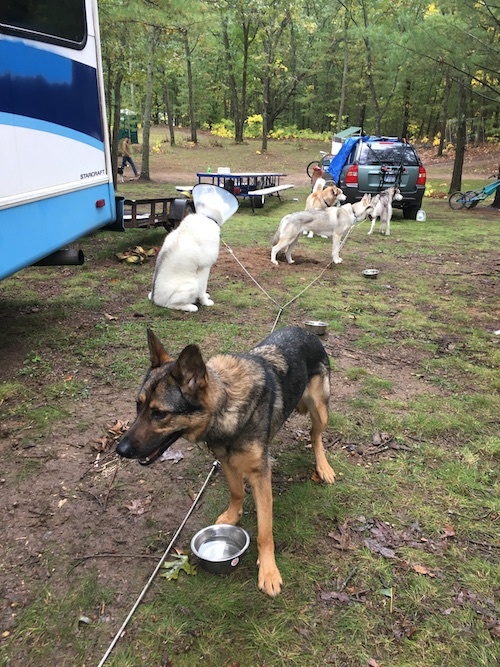 I do know quite a few other shepherds who also mush; two teams in particular I've met and seen run multiple times (with multiple shepherds). 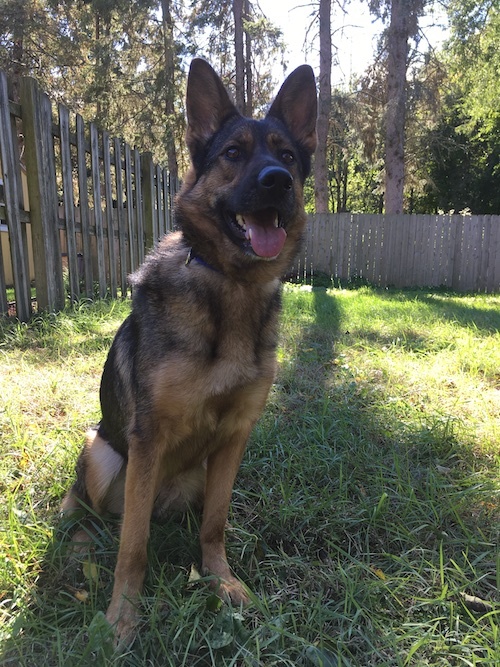 I can only speak to my experience with Zage, because as with all dogs, they're each their own self. and working to start to figure out what I wanted. She worked solo with me, just pulling a small weight on her tugline attached to the harness; we worked just on a collar with the bike; on foot and on wheels working on driving commands; and then she had that run on the quad with a very experienced team before we ever did harness work with a bike. After a few times out, she understood that she was not only allowed, but supposed to pull! (going out with other dogs definitely sped up this process) Zage likes to pull, but there is a marked difference from the very drivey huskies I've seen (they do vary in pull drive). Now that she knows what the harness and lines mean (and even my usual joring pants! ), Zage also gets pumped and very ready to go, but it's expressed differently and on a different level than most huskies I've seen. So there's my not-so-short answer! Last edited by Mesonoxian; 03-10-2019 at 11:56 AM. Though we had a very wet fall overall, we also had many, many beautiful days. One lovely afternoon in October, we spent all afternoon in the backyard - I was mostly reading, while Zage and Lena patrolled the area and tracked the squirrels and birds. The sunshine made it easy to get some colorful pictures, too! Well that sure had to be a lot of fun! Enjoyed your photos! There is definitely a difference! The huskies I know personally (and others that I've met at events and trainings), both Siberian and Alaskan, do have a genetic drive for the pulling. That is their purpose, and they live for it! If you ever have a chance to attend a race, it's so cool to see those dogs light up when they see the chance that they may get to go run with their musher...So there's my not-so-short answer! This is very interesting to me! Thanks for the long answer! Just a few pictures of everyday life from the autumn of 2018. 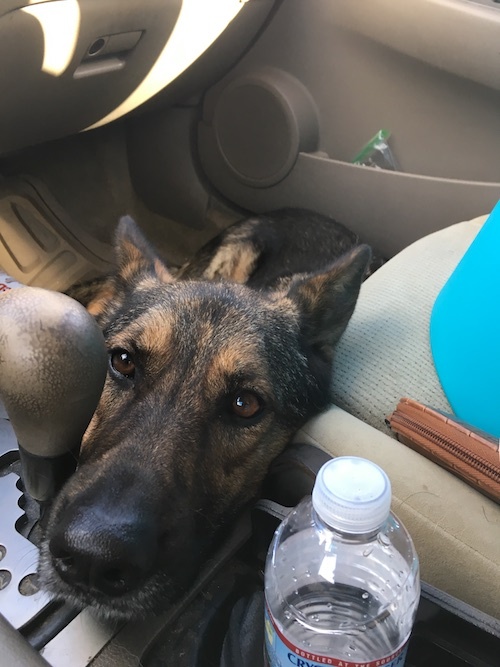 Zage asking for some head scratches in the car. 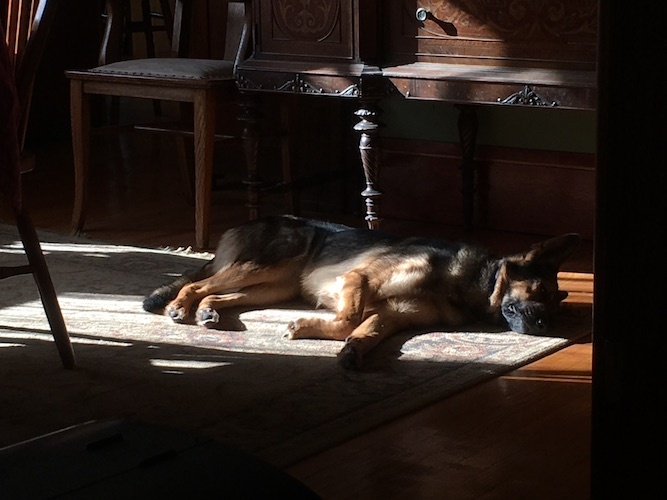 When a patch of sun appears... basking and napping is a must!